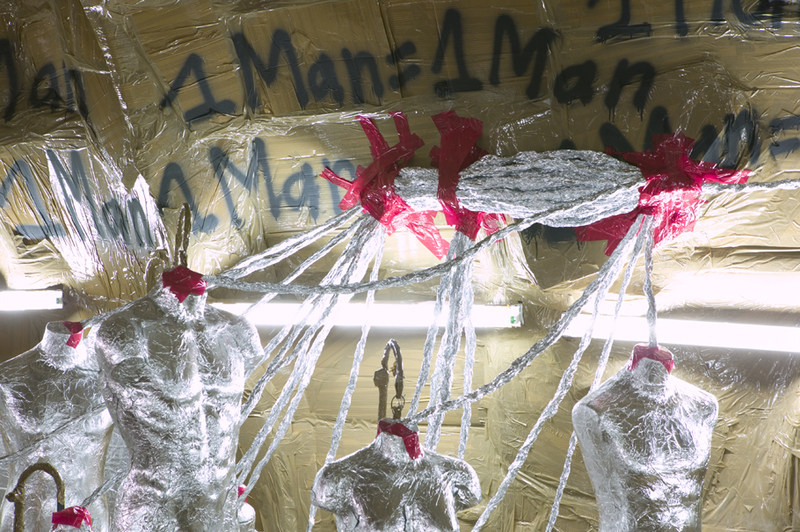 When Swiss-born artist Thomas Hirschhorn visited the Walker last month to install Cavemanman, he spent a few minutes with me discussing the piece, a massive network of tunnels and caves made from cardboard, mailing tape, aluminum foil, and other everyday materials. In this interview, he discusses how his work is a “collage in the third dimension,” the historical and contemporary influences behind the piece, and how a cave is a good metaphor for the mind. Paul Schmelzer: Your material is really accessible. 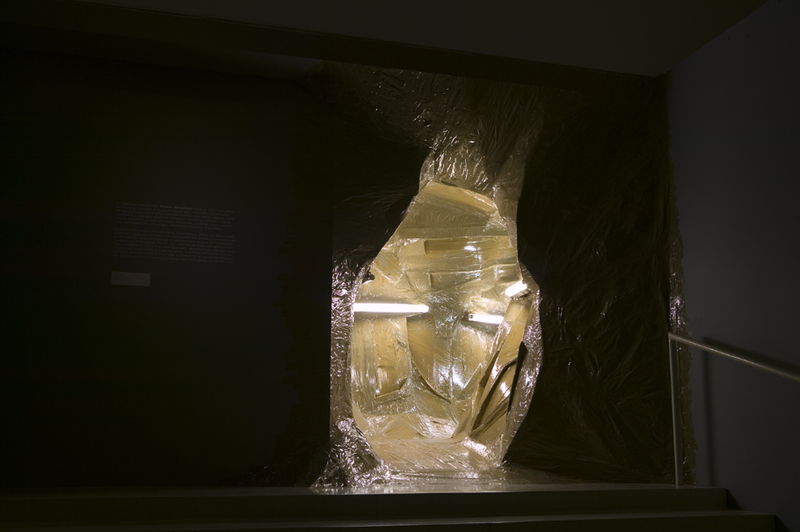 It’s not high-art material: tape, aluminum foil, Xerox copies… Could say more about that? 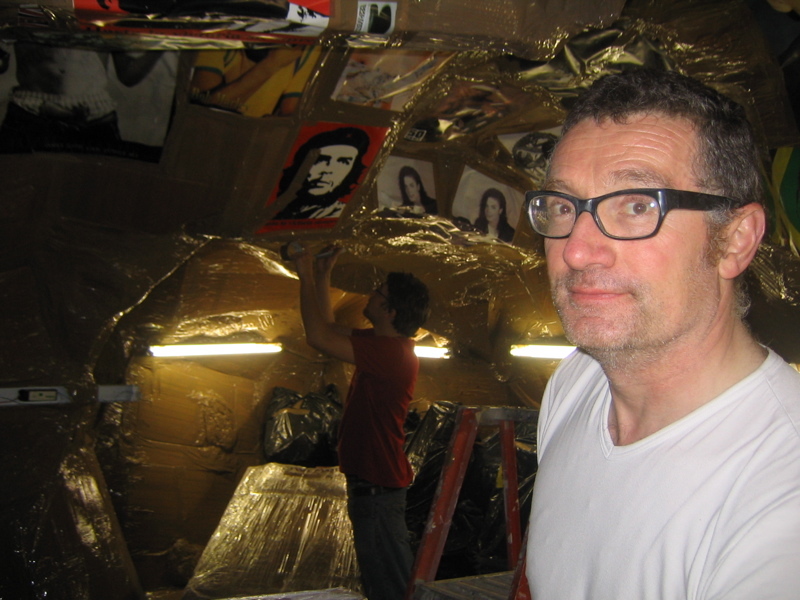 Thomas Hirschhorn: I really try to use materials that everybody knows and uses in their everyday life, not for doing art. It’s very important to me that there is no question about from where the material is coming. So tape, cardboard, paper, photocopies, mailing tubes, silver paper: it’s very important to me to have materials that are in everyday use. Also, I like that [they don’t have] this arty aspect. There’s no kitsch behind it. The question is not what material is it from, the question is what’s it about? That’s why I use this material, because I believethey have a part of universality inside them. Schmelzer: I also see there are a lot of mass communication, mass-culture items. All the philosophical tracts are Xeroxes, which is a mass production technique, and there’s also stuff from mass media. Hirschhorn: They are a tool to make a window to another reality, or our reality to another world. I like to start with materials. They are accessible, and they still exist, because in fact it’s about a collage. It’s a collage in the third dimension, not in the 2nd dimension. What means doing a collage? It means to put things together who are not made to be put together. This is a collage, and here it is in the third dimension. Schmelzer: Your politics have been described as radical, but I like to go back to the etymology of words. And radical doesn’t mean “extreme,” it really means “to the roots,” if you break the word apart. Are your politics radical in that traditional sense, or in that earlier sense, that sense that you’re going back to the roots of what’s fundamental about democracy, for example. Hirschhorn: Absolutely. I’m interested in working politically, not in doing political work. Doing work politically means, yes, to question the material, to question the work that is done, to question every element: is every element I use, is it an offer, is it a key, is it a possibility to give the tool for the spectator to establish a dialogue or a confrontation with the work. That means to me, for example, working politically. In this way, yes, I would like that it has a kind of radicality, but in the small questions of materials, of elements, of light, of space, every question embracing my tool as an artist to give form has to be radical, yes. Schmelzer: There’s often an immersive quality to your work. It’s often an environment you go into. It seems there’s extremeness in the emotional quality; for example, the piece you did early in 2006 with the images of victims of war (Superficial Engagement) or this one, it’s a bit claustrophobic, it’s lots of shiny things and bright things and bomb metaphors. So you’re dealing with things that are emotionally pretty powerful, but also intellectually powerful: Noam Chomsky and Bataille and Foucault. Is this your way of getting people to react, or is it your way of exploring ideas you care about. 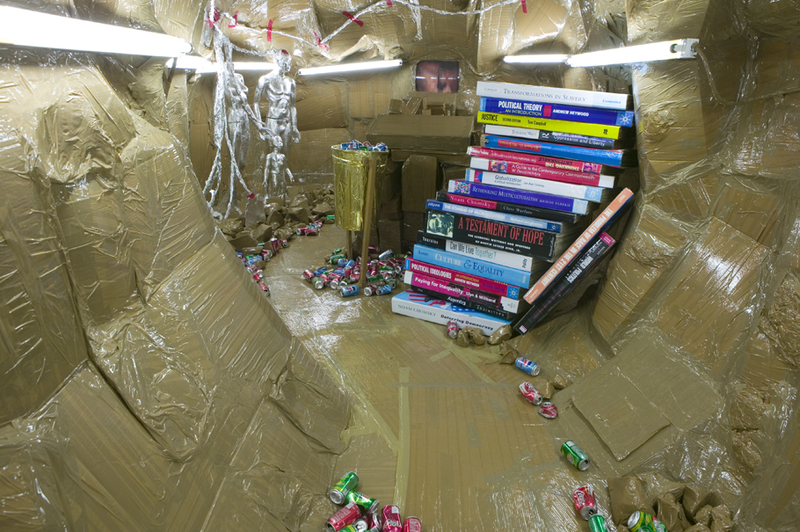 Hirschhorn: To me, it’s never about getting people to react. As you say, the immersive manner: I feel as an artist I have to do too much. I have to do the whole thing. It’s always about the whole world. It’s always about the entire possibility, the entire thing. And of course, that’s pretentious and it’s ambitious, but in another way, it’s stupid, also, to want to do this. I have, as an artist, to stand out this ridiculousness of this ambition and this pretension. It’s always about the whole world. So that’s why I like to be over-formed, to make too much, to put everything inside. To try again and again, to put everything into the work. It’s about me, about how I see, as an artist, I can work. It’s not about a spectator who has to react or not to react or who I want to provoke or not. Never. It’s always about: what’s my tool? I think this is one of my tools; the immersive, the too-much, the stupid, the way to go over something who is permitted in a way. Schmelzer: This work is all over-the-top consumer society kind of stuff; and the fact that you’re using what could be seen as stuff you’ve found on the street, is there a critique or a way of addressing that—the consumption culture idea? Hirschhorn: It’s not about a critique of the consumption culture or the consumption society we live in. I’m a part of it. I’m part of this chaotic world. I’m a part of this unclarity in the world. I see as one of my missions as an artist to work in this unclarity, to work in this chaos. Not to bring clarity, not to bring clearness, to struggle with the chaos. To struggle with what’s around me. For example, to work in the chaos of the world means not to me create clear forms, to make less things or make not a lot of things. For me, to go in the same direction and even beyond this chaos and this unclarity is what I think I have to do. Schmelzer: Now this piece, Cavemanman. You said you’re not trying to say just one thing, but, this obviously is the hermit’s cave, the bin Laden hideout, maybe even the little hole in the ground Saddam was found in, the philosopher’s cave: what was your impulse to begin this project? Hirschhorn: Not in Lascaux, near Marseille. He did make graffiti, and what did his people make 30,000 years before? Aren’t they graffitists also? That was one of the points, to say I have to work out an un-hierarchical form, because we know caves—there are also fake caves. There are fake caves that are recent, there are fake caves that are very old. There are caves that have nothing inside—no painting or perhaps the painting disappeared. There are undiscovered caves. So I wanted to give this un-architectural and un-hierarchical space form into the cave. That’s why in fact the idea of a cave arised. cave of Tora Bora or the caves people take to find refuge all over the world. This was the point of start for my work Cavemanman. Schmelzer: I’m curious about the imagery from magazines here; it seems there’s a lot of images of progress and production and marking—sort of marking the earth much like they’re marking the walls of the cave. Hirschhorn: Yes, absolutely. We are here in this cavation with these color pictures on the wall. What they share together: people at work. Every one of these people has a mission, has something to do, is at work. So I wanted to connect them to the entire history of caves: where is the space more for contemplation or religious space or a space we don’t for spirit or we don’t know. I wanted to connect it to the reality of work. To me the cave that is just a picture, the cave is in your brain, the cave is in your mind. We have our own layout of a cave in our mind. That is why, in fact, Cavemanman. Schmelzer: Not an archetype but an individual conception. Hirschhorn: Absolutely. I believe there is the possibility to structure your mind in a cave with cavations where you put something inside, with garbage, with unspeakable things. We think there’s no light on it, we think they’re forgotten. So, yeah, it’s a metaphor for the space in the mind. Schmelzer: That leads well to all the books that are here: you have large-scale replicas of books, you have actual texts from different books of philosophy and economics even, it looks like, and political theory. And then there are these bomb-like things connected to them. It seems pretty directly that there’s maybe an explosive potential of knowledge thing, but there must be more than that! Hirschhorn: Of course, the books are important, but not as material to read, but more as the knowledge was here, but who has to be applicated. It’s about the understanding of the world. It’s not about the knowledge we have or have not. That’s not the question. So it’s about this, that’s also why the books are not reachable in the cavation. The shelves are too high. Here there are text excerpts that could be like a decoration. Of course you can read it, because that’s always the possibility I want to give. Then the enlarged books, of course, that make an engagement to the same time, the book becomes empty because you cannot read it. So it’s important to put together these two meanings. Finally the dynamite bombs with the books, of course it’s an image, as you say, yeah, the dynamite or the explosive in a book, but also it’s an image to me perhaps also to a paranoia idea of somebody who wants to make fear to someone who comes to discover his cave. Lonely people they have this kind of paranoia, this kind of thinking to protect themselves with this often fake protective materials. It’s another image of somebody retiring himself and trying to confront the world. Schmelzer: It reminds me of Ted Kaczynski, the Unibomber. Hirschhorn: Absolutely. It’s not about him, but it’s just about this kind of, in a way: you have to confront the world. It’s important not to retire yourself in a cave. But in another way you have to build this cave in your mind and to struggle with what happens in this cave, in confronting it with the world. Schmelzer: When I first started at the Walker back in ’98, the first piece I saw of yours was, in [the Walker Art Center exhibition] Unfinished History, a big Swiss Army Knife, but I didn’t understand it at all… but the materials, post-9/11, really speak to me much more. When I look around here, I see detritus, the sort of things we all saw blowing through the streets after the World Trade Center fell. Do you see your material differently after a big disaster like that? Hirschhorn: No. It’s interesting what you say. I saw the pictures, of course, of the dust, for example, after 9/11. I saw the pictures of the millions of papers fluttering down. And, yes, it doesn’t change everything to me, but in a way it’s true. These materials, for example, that could have an importance so much at the moment on somebody’s office desk, and because something completely crazy happened, at a moment everything changed and the paper got completely no more importance to nobody. This is interesting me, because I always believe always… nobody can say to me what’s important to me. Everything can be important to everybody at a moment and at a time. This is the thing I get with this visual experience I had, the importance of things. The importance for one human being, for one element, one shoe or one thing you can see after this kind of incredible event happened; that’s touching me. I was always interested in these elements. Schmelzer: The other day when we spoke, you mentioned the theme of the larger show this is part of, Heart of Darkness. Does that title or your knowledge of the Joseph Conrad book, does that change how you view this work? What do you think about the theme? Hirschhorn: I think it’s fantastic. It’s a really great theme. First of all, it’s a really beautiful title, of course. And I think—I’m really happy to be in this exhibition because I think there is really a concern that is so deep in this time today, and I think to these four artists who exhibit, everybody, a kind of big work, who is in a way have built a world for himself, each. It is an ambition to build his own world. I like it a lot. This is really what I want, and perhaps what other artists want—to build a known world and to confront this world directly with the world we are living in. Heart of Darkness is beautiful because there is a heart also, in the darkness, also in the unspeakable, also in something very non-communicatable. Schmelzer: You just struck on the theme of one of the rooms: “1 man = 1 man.” It strikes me that, much like the marking of a wall of a cave 30,000 years ago or the marking of a graffiti wall today, or the way one person’s life is destroyed in 9/11 is the same as one person’s life being destroyed today in Iraq right now. It seems like there’s that idea here, too, all the way around. This work is going to be hard for people because it’s not pretty, but it seems to have an essential love and equality about it. Hirschhorn: Yeah, there is a heart. Absolutely. That’s why I like the title (Heart of Darkness). There’s a heart. But I don’t want to be kind, but the heart is the beautiful idea of equality between human beings. In a way I wanted to stupidly write it on the wall like graffiti: one man = one man. But in another way, I needed to build a cave that this idea gets acceptable in away. Everybody says, “Yeah, yeah, yeah, yeah, but…” No, no, no, it’s not about but. It’s not about fact. It’s not about journalism. It’s not about who is wrong and who is right, who is OK, who is not OK. It’s just about this idea: one man = one man. This is why I needed to build the whole cave. Schmelzer: So you’d have a wall to hang that message on?